Safe and friendly. Filled with friends, conversation and smiles. A place where comfortable homes set the stage and congenial neighbors complete the canvas. 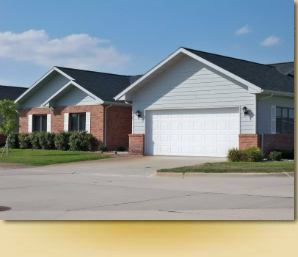 That's the kind of neighborhood we've created for you in The Village at Riverside Lodge in Grand Island, NE. You'll revel in the security of a fenced and gated community – filled with amenities like a clubhouse, a serene pond with a fountain and beautiful landscaping at every turn. Nestled inside the community are approximately seventy living units – lovely duplex, triplex and fourplex homes – each customized in order to make The Village as pleasant on the interior as it is outside. Located adjacent to Riverside Golf Club, The Village is just minutes from shopping, restaurants, churches, and civic activities. Village residents are also free to join in activities at the Lodge if they choose. From basic floor plan choices to optional interior features like vaulted ceilings, fireplaces, island kitchens and more, every home will bear the unique signature of the person who lives in it. Covenants will ensure that The Village will always remain a retirement community, protecting your investment and keeping it a place where you can enjoy the rewards of a lifetime of work.